How to properly set url-routing for tx-news in TYPO3 9.5.5? Correct way to subscribe and update URL query variables in Angular? Even TYPO3 and PHP cache flushing doesn't help. Does it need "defaultController and defaults: page: 0"? I have an Angular application with a multi-selection menu (Component A), which determines the data displayed in a second component (Component B). Initially they communicated directly, but when the time came to add query variables to the application URL (to enable bookmarking), I began getting 'value changed after it was checked errors'. To fix this, I implemented the approach in the diagram below. 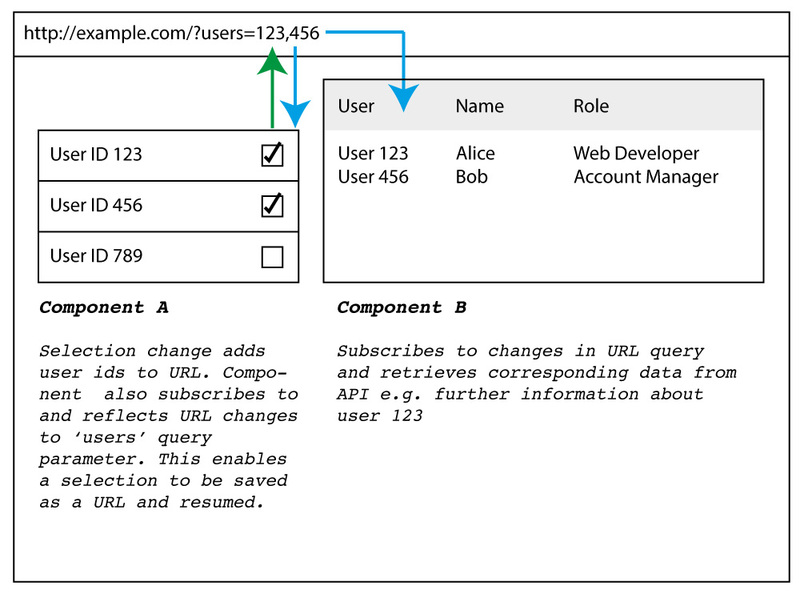 The display component (B) also subscribes to changes in the URL and retrieves data from an API when the user IDs in the URL change. This works and is error free, but it feels convoluted that communication between the components is 'via' the URL. Are there any drawbacks / criticisms with this approach and is there a better alternative, e.g. routing?